I sometimes get stuck in a rut with ground beef. There's tacos, burgers, meat sauce for spaghetti....then I start drawing a blank. I headed to the trusty search engine to help me get inspired the other night when my husband brought home a nice three pound package of ground beef. Ah, yes! 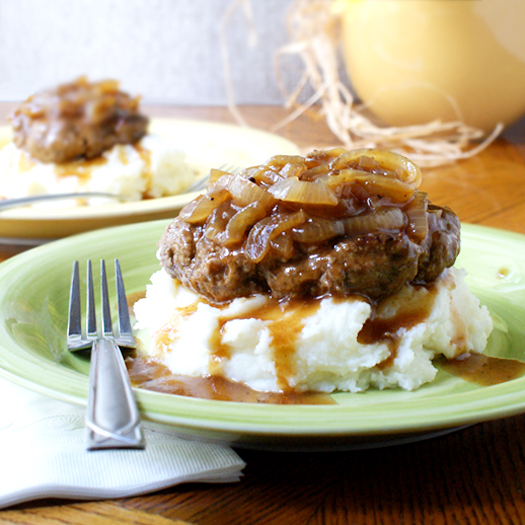 Salisbury steak! How do I forget this one when I looove it so much? 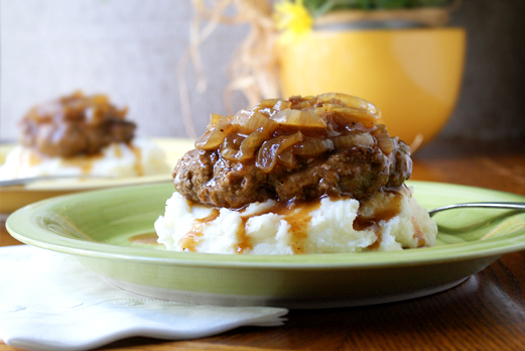 It's like a glorified burger on a plate, full of flavor and smothered in onions and a rich beefy gravy. And don't forget the mashed potatoes. 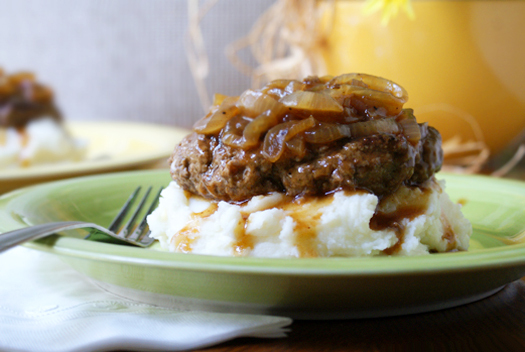 You gotta have mashed potatoes with salisbury steak. If you don't have the mashed potatoes with it you're not doing it right. It's like having a chocolate chip cookie without the chocolate chips. Get it? So give it a go if you've been in a ground beef rut, like me. It'll make it into your meal planning rotation, I'm sure! In a large bowl, combine the ground beef, breadcumbs, dry mustard, 4 dashes of worcestershire, 1 tbsp of ketchup and salt and pepper. (Use your hands...it's the only way to get it done.) Pat the mixture into 4-6 oval shaped patties, depending on how large you like them to be. In a large frying pan, heat the oil over medium high heat. Fry the patties for 4-5 minutes per side. Remove from the pan and pour the grease out of the pan. Add the butter and onions to the pan and saute until soft, about 5 minutes. Add the beef broth, 4 dashes of worcestershire and 1 tbsp of ketchup to the pan. Simmer for about 5 minutes. In a small bowl, make a slurry with the cornstarch and a little bit of water or beef broth. Add to the pan and simmer until the sauce thickens up. Return the beef patties to the sauce and cook unitl they are heated back up. Serve with a side of mashed potatoes and whatever else suits your fancy! Source: Adapted from a recipe by Pioneer Woman. In direction 4 it says you should add 4T Worcestershire, I believe it should be 4 dashes. I corrected it. Thank you! !